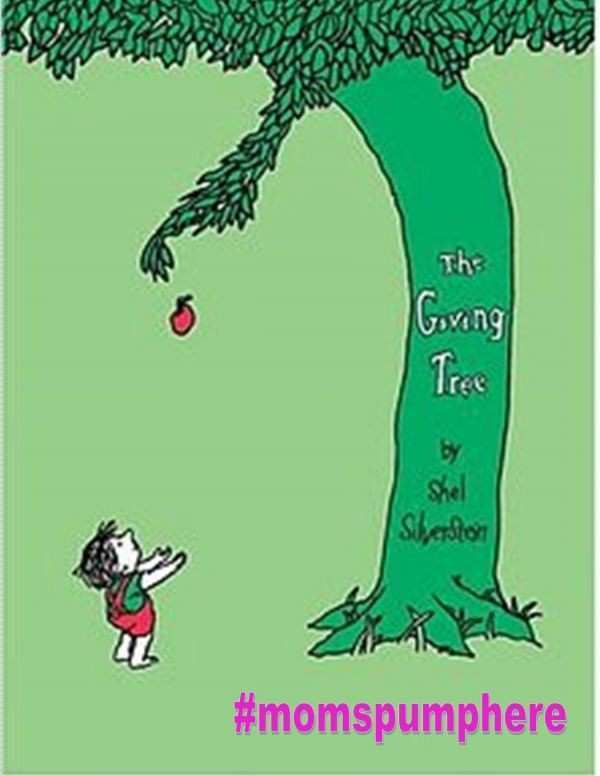 This week my 3 year old picked out Shel Silverstein’s “The Giving Tree” from the library. We took the book home, cuddled up in the rocking chair in his nursery and began to read the classic. I was reminded of my boys’ arms around my neck, the cuddles while we were reading, the face touches, the hair grabbing when we rocked in their chair. “What a nice story,” I thought. The story went on and I began to cry. Parts of the story were so sad to me: the boy leaving the tree, and the tree feeling sad; the tree giving the boy all her apples so he could sell them for money to buy things to make him happy. The boy wanting a family of his own, the boy wanting to sail away, the boy wanting to rest and the tree always wanting to make the boy happy – these made me think of my own boys. Sleepless nights, worried mornings when they’d wake with a fever, carrying the pump back and forth to work, preparing bottles, counting how much milk they’d take when we were apart – a mother’s work doesn’t stop. Like the tree, a mom keeps on giving. My son asked me to stop reading because “books are happy and this one makes you sad. Let’s read another one.” He handed me Star Wars books, Curious George books, and Batman books but I told him it's a happy story and I wanted him to see how it ends. We continued with the story and learned of the tree giving the boy her remaining seat so that he could rest when he was tired. ”Well”, said the tree, straightening herself up as much as she could, “well, an old stump is good for sitting and resting. Come, Boy, sit down… sit down and rest”.